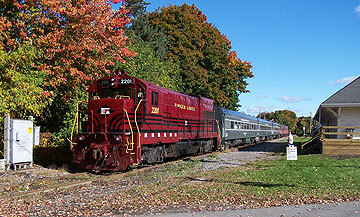 Finger Lakes Railway engine number 2201, a General Electric model U23B diesel locomotive painted in the Lehigh Valley Railroad color scheme of the 1950's, is seen on the annual fall foliage excursion train at the Lehigh Valley Railroad Historical Society station museum in Shortsville, New York, on October 11, 2009. Photograph by David Halderman. The Lehigh Valley Railroad Historical Society Station Museum at 8 East High Street in Shortsville, New York, will be open to the public one Sunday afternoon a month from May to October this year. Open house dates will be May 19, June 16, July 21, August 18, September 15, and October 20. Hours will be 1:00 p.m. to 3:00 p.m. A large collection of historical artifacts from the Lehigh Valley Railroad is on display at the museum. The gift shop will be open. We will be inviting rail historians to give presentations at some of the open houses. Admission is free; donations are welcome. Other times by appointment only. For more information, call 585-289-9149. The Lehigh Valley Railroad Historical Society is actively seeking new members for our group. Volunteers are needed for museum operations. Please print and fill out the membership application from the Join section of our website. Thank you for your interest in the LVRRHS. The Lehigh Valley Railroad Historical Society welcomes donations of local railroad artifacts and model trains to our museum. Please fill out the donation form below and contact us to make arrangements. Thank you for your donation. This is a fill-in PDF, so you can either fill in the form on screen and print, or print it and fill it in manually. Do you have a relative that worked for the LVRR? We are maintaining an alphabetical record of former LVRR employees, containing general information and specific railroad job descriptions. If you have a relative that worked for the LVRR, please fill out the LVRR Employee Information form below and submit it to us. Next LVRRHS Station Museum Open House: Sunday, May 19, 2019, 1:00 p.m.
Next LVRRHS Meeting: Sunday, May 19, 2019, 3:00 p.m.